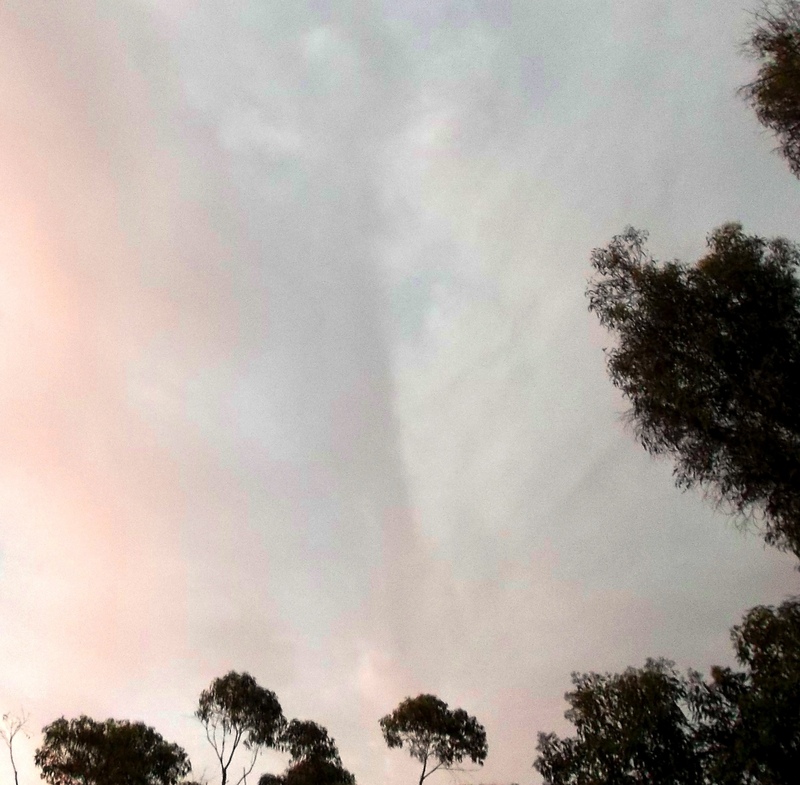 The Shem Arua, north of Perth, Western Australia, January 10th, 2015. This page is dedicated to my beloved Ashura, our eternal union as One Flame in divine light & full awareness, and to our dear Leonine star sister and brother, Al’tara & Arudia, who have now stepped in to captain the Shem Arua. 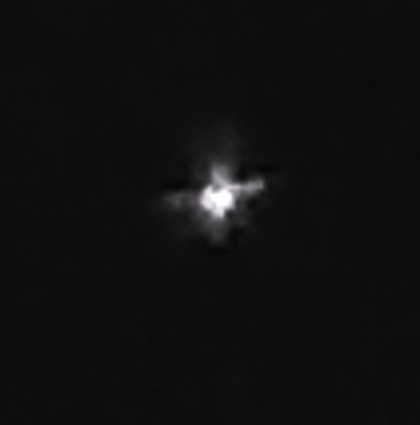 The Shem Arua, until mid-2016 captained by Ashura (you can read about our Twin Flame connection here), is the starship I had most contact with for two years from early 2014, have seen across dimensions in inner eye, seen physically several times, bilocated into, and photographed often above my home and other locations…and we still connect often. 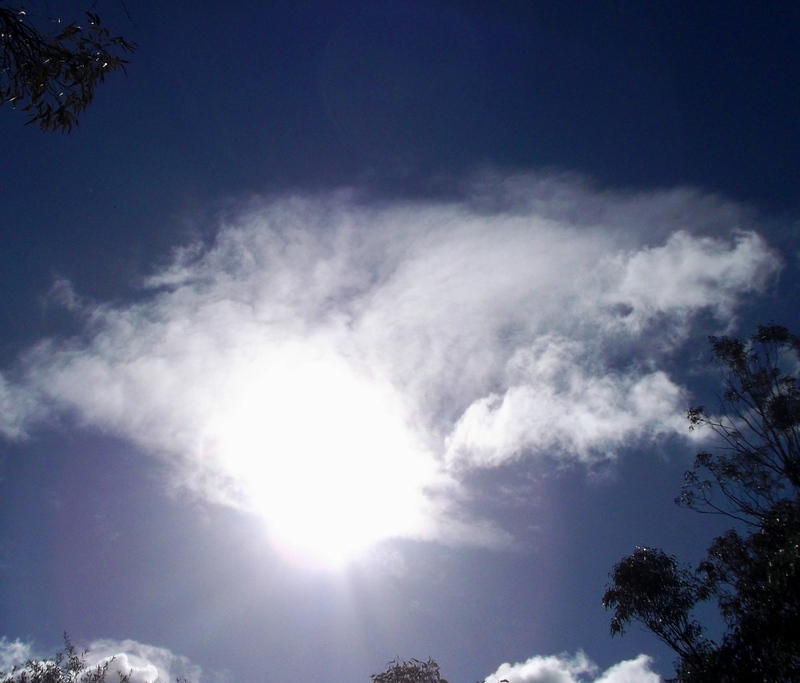 In 3D, the Shem Arua appears as a large bright silver-white disc, or its position is frequently marked by a disc-shaped outline in the clouds. In 4D it appears as a series of concentric blue rings which have been described to me as a ‘visual representation of its wave-form modulations’. They also represent the phasing of the ship across dimensions. In 5D the Shem Arua appears as a vast sphere of crystalline white light. What is visible to me inside it depends on my inner focus at that moment. One detail which remains constant is the core of the ship, a vertical double helix of golden light, spinning faster than physical light, and in its centre a diamond-shaped purple crystal with a white light centre. The golden helix is connected to Twin Flame-One Soul energy, which goes beyond material existence. Twin Flame is an energy of Source, primary soul extension from the field of spirit that expresses a third frequency, the Trinity energy. In union as One Flame the feminine and masculine expressions of Source energy merge continuously as one, generating pathways of new creation, rebirth, the golden spiral flower of life, a spirit light spiralling around itself eternally at one with the light and life of Source, the infinite consciousness and energy that powers stars, planets, ships, atoms, bodies, or as a sacred energy contained wholly within Source’s core. It all depends on the focus. That’s what we all are: pure essence, sparks of Source focused into various frequency bands (dimensions) of Life. One translation for the ship’s name is ‘Light of the Lion’. A-Ru-a means: A=’I’ (Source self/higher self), Ru=lion, and ‘a’=’I’ (small self/ego self), so it reads as I-Lion-i, or in English we would express it as I Am Lion, ‘Lion higher self expressing into small self’. ‘Ru’ also means language/speech, so Arua is Lion energy forming into speech/light language. 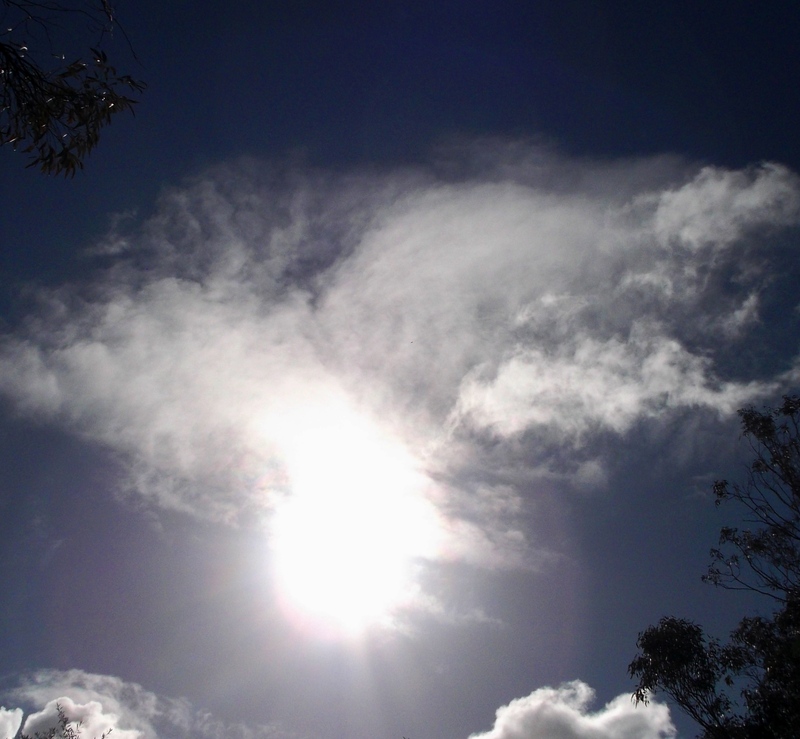 Shem is Light (divine light/light of Source). So the ship Shem Arua is a communicator/transmitter of leonine divine Light. 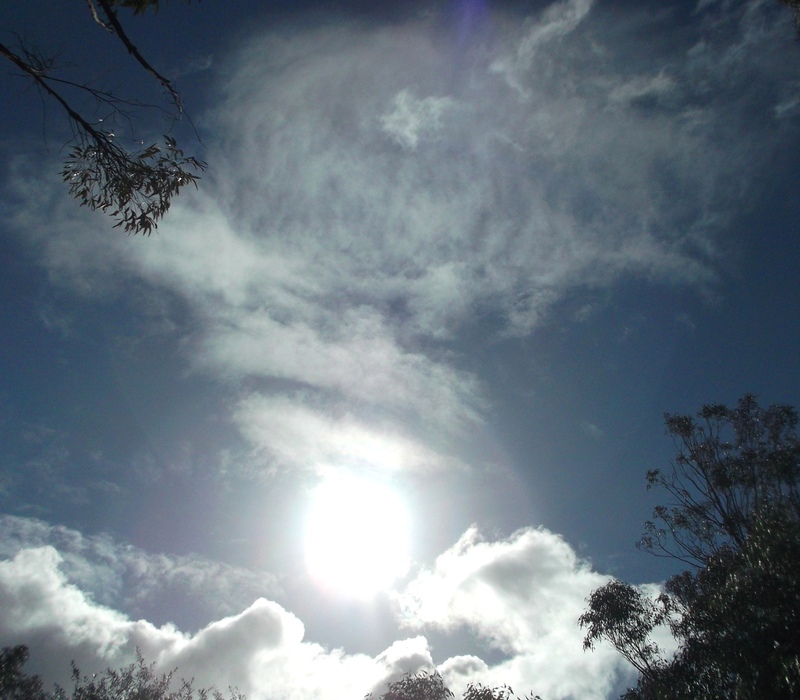 Translating from the Angelic stream, Shem Arua is ‘Divine Light steers us’. Here, in Arua we are reading ‘Ar’ in its angelic form of ‘to steer or guide’ with ‘u’ (you) and ‘a’ (me) fused together as ‘us’. So feel the two translations together as a Leonine-Angelic merge. Ashura (known in his 5D light-form as Arnap in the star-fleet) is brother to Ashira and Ashtar, who oversees the Ashtar Command wing of the Intergalactic Confederation. They/we are Angelic in higher dimensions, from Arcturus, with a wide array soul expressions across many dimensional stratas and universes. The Shem Arua, originally a Sirian ship, now with Arcturian attributes, was gifted after our ship was lost at the end of the Maldek wars, now joyfully restored (see the Mary’s Star page). ‘Arnap’ is an honorific meaning ‘One who steers (through) the Bow’, or simply Bow-Steerer. The Bow is the Feminine energy of Source, the crescent, arch, protecting shield (feel into the Egyptian goddess Nut arched over the universe, or Mary and her Protecting Veil). Ashura’s essence is fidelity to Source, loyalty, a guardian and champion of the White Rose of the Mother. The energy of the White Rose is akin to the white light in the heart of the purple Crystal in the Shem Arua’s core, the white flame of the divine Mother, the Ascension Flame, and is our soul emblem. To Ashura, to Al’tara & Arudia and all on board the Shem Arua, all members of the Ashtar Command & Intergalactic Confederation, and all souls on and around the Earth anchoring higher frequencies into 3D for this planetary shift, thank you and love always. 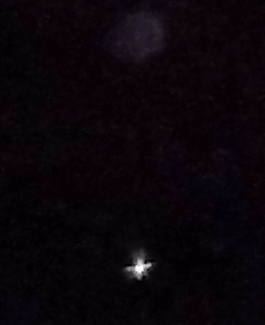 Arcturus, a star-home of the Angelic races. 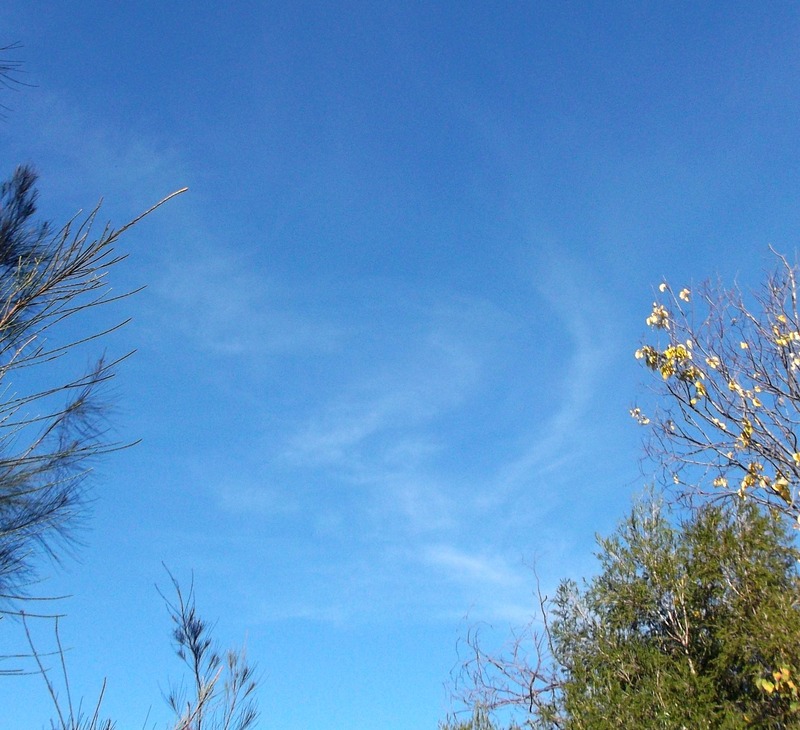 Below are some of my photos of the Shem Arua, taken from March 2014 onward. I’ll keep adding photos to this page as they come through. 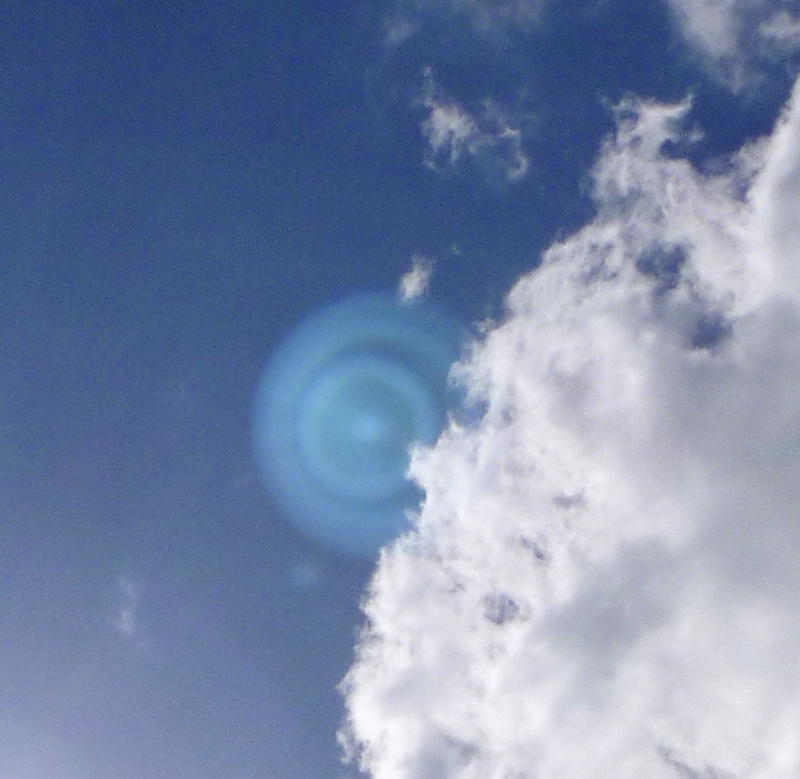 You can see the progression from 4D ‘blue rings’ to 3D appearances as a silver-white disc of light, and cloud holes/forms. At the bottom of the page are links to posts about the Shem Arua, if you’d like to read further. 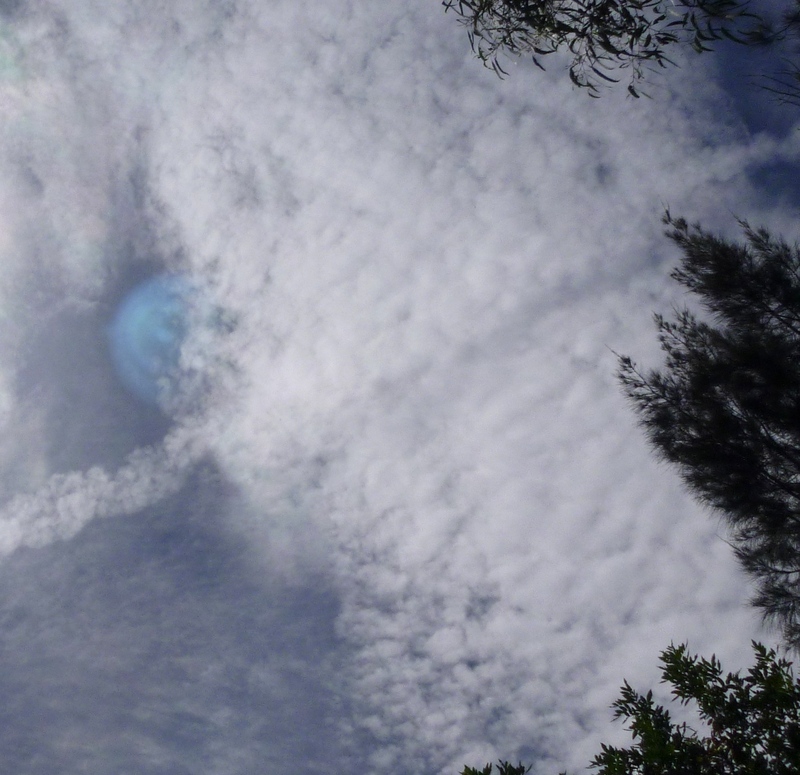 In February 2014, I felt a ship camouflaging in a ringed camera lens flare, and asked if they could reveal themselves (I didn’t remember then who Ashura was or the deeper truth of our connection). 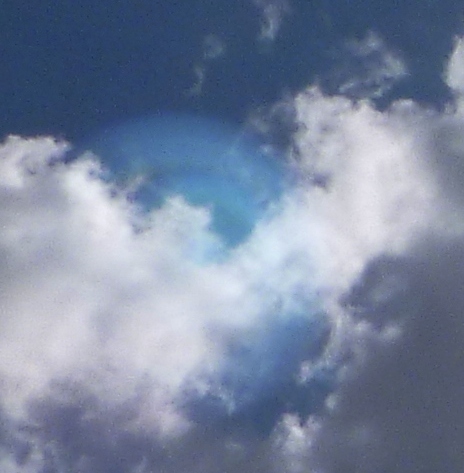 The Shem Arua immediately went partway behind a cloud, showing itself as a ‘spatial presence’ rather than lens flare, which can only be in front of objects in the photos. 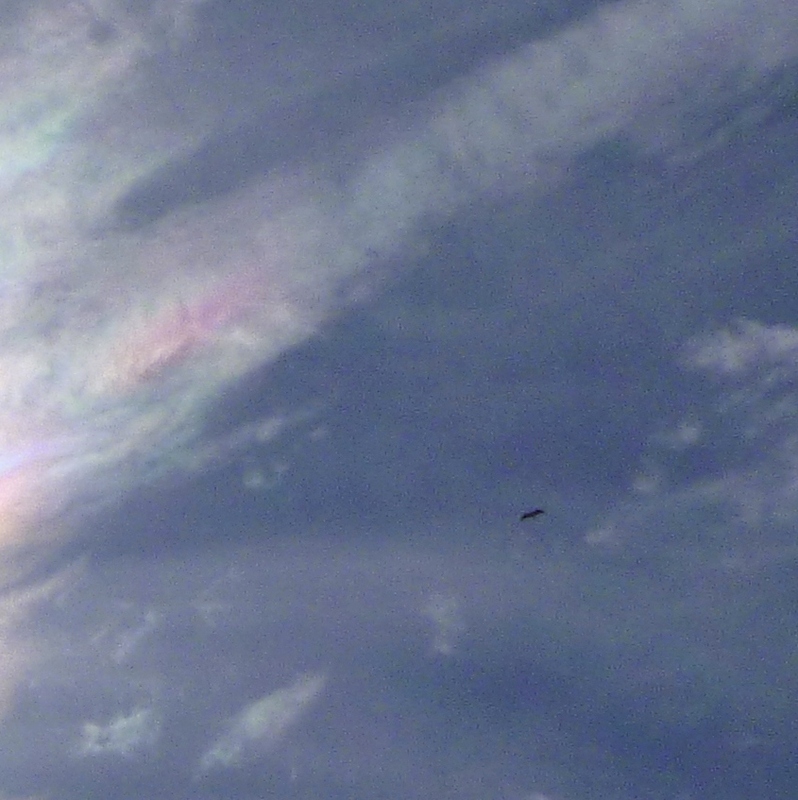 The ‘wave’ energy of the ship sometimes shows as concentric rainbow ripples. 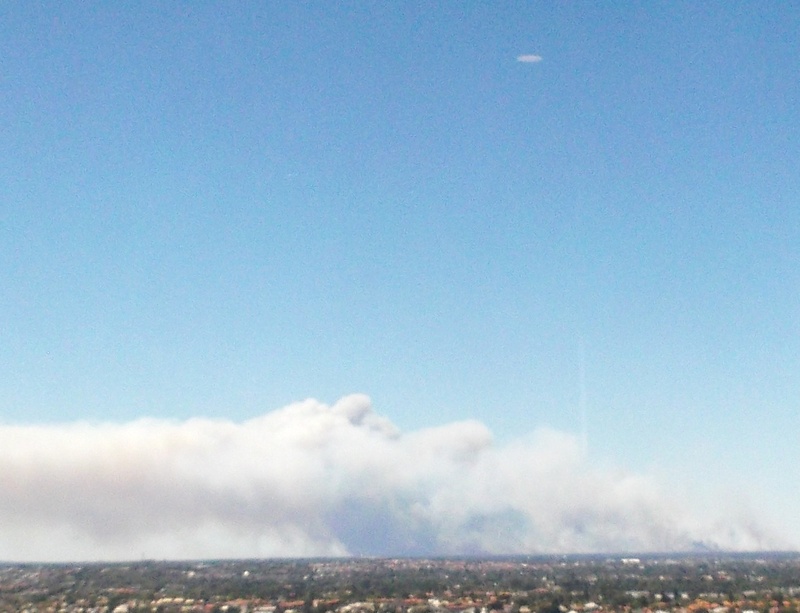 This next photo was taken by my friend Rob Hartland, who lives a few streets away (you can see more of Rob and Shelley Hartland’s excellent photos of craft flying over this area on their site here). I’m posting Rob’s photo on this page because he took it early on the morning of October 7, 2014….9 hours after I posted Lights in the Sky Part 1 on the night of October 6, with the first mention of the Shem Arua by name publicly. 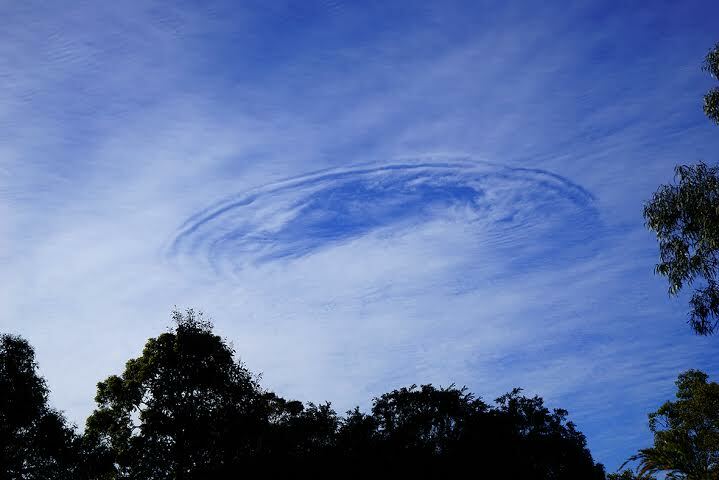 Rob was facing along a road that points toward my house, and the cloud-ship with its concentric rings at the rim (dubbed erroneously by mainstream press a fallstreak hole caused by planes and ice particle build-up) is above my street in his photo. I took the next two photos in early January 2015, facing north toward Rob and Shelley’s house. 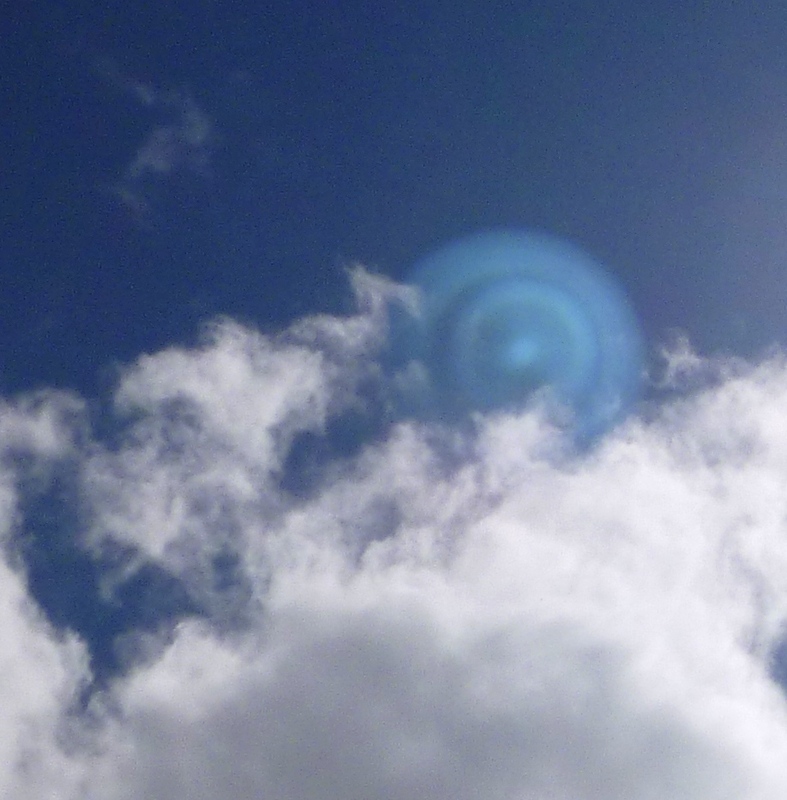 These disc-shaped ‘holes’ and rings in the clouds were in exactly the same position as in Rob’s photo, taken from the opposite direction – good ‘substantiating evidence’ for those requiring it. 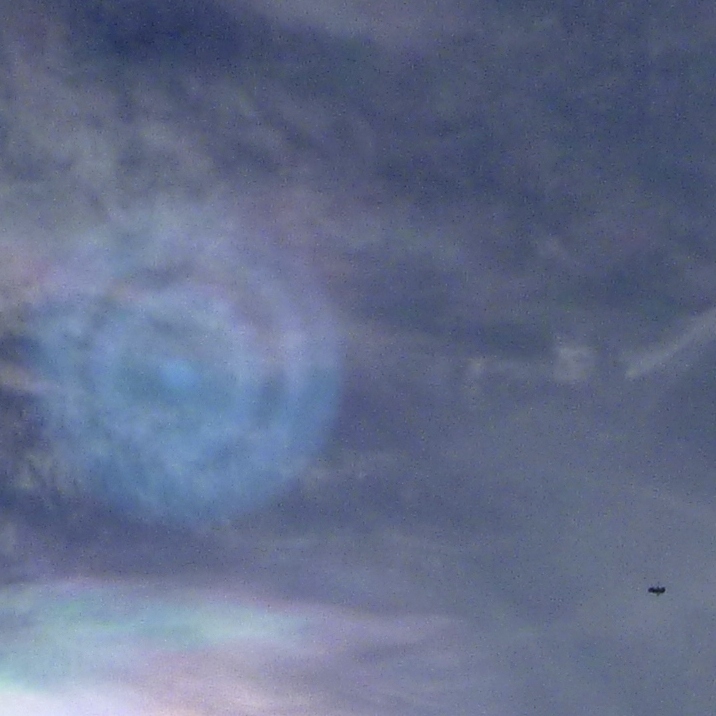 (Also, on October 7, Rob watched the cloud-cloaked ship moving east at 7:30am. 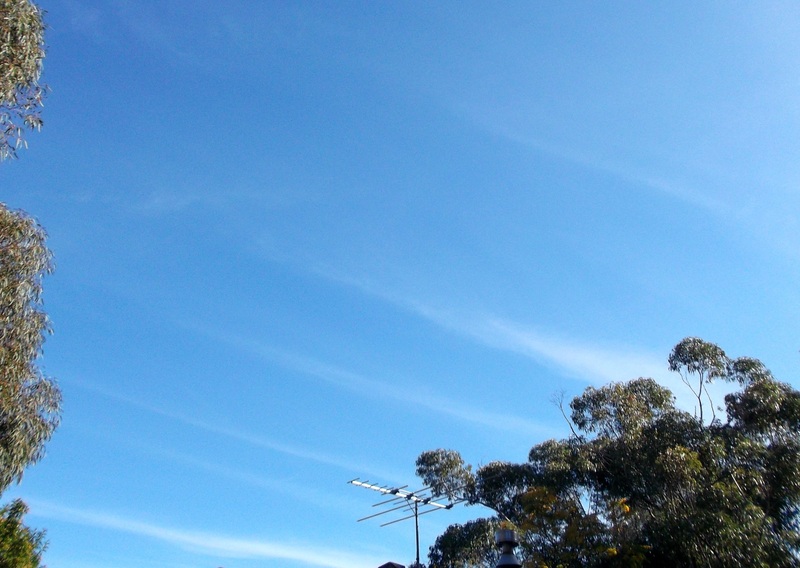 Other people took photos which can be viewed online here, south of Perth airport between 8-9am, which means if it was a ‘fallstreak hole’ it had formed while heading east over the hills, then reversed direction west-southwest to pass over the airport and nearby suburbs afterwards – so it wasn’t formed by planes). 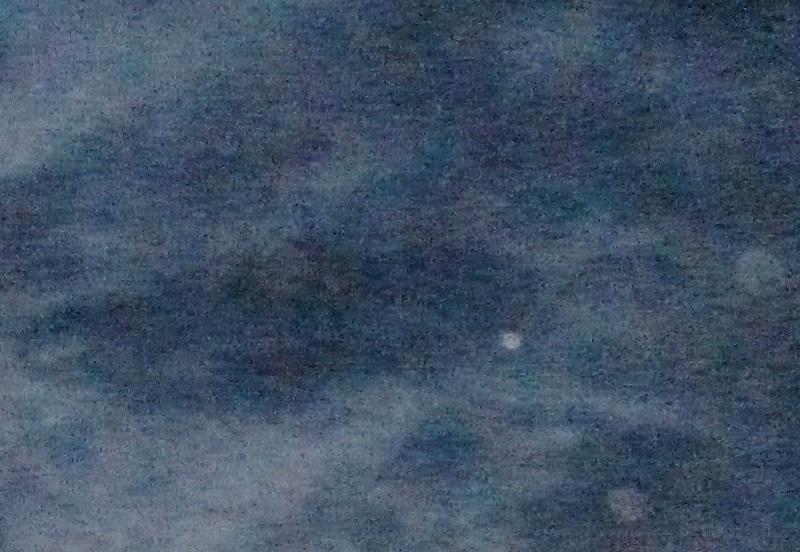 In the next photo, the disc shape of the ship can be seen at the top centre of the photo, with a long vertical ‘fold’ pulling the clouds inward directly beneath it. There are two small white cloud ‘arms’ below the ship, at the top of the fold, forming an ankh shape (symbol of Life and regeneration). 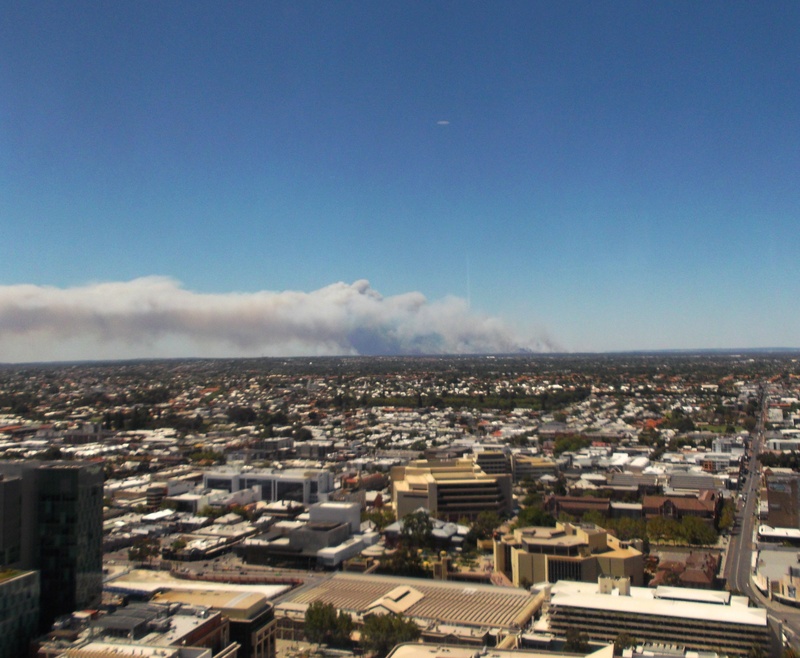 The next sequence was taken on January 10, 2015, from the 33rd floor of a city building, looking toward a bushfire burning at Bullsbrook, north of Perth. 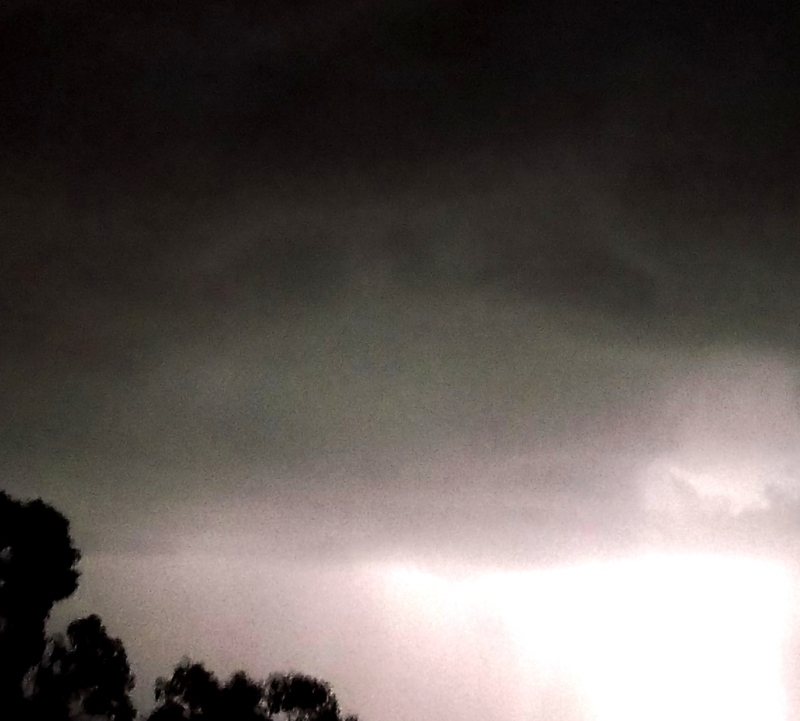 The Shem Arua was close by over the city. 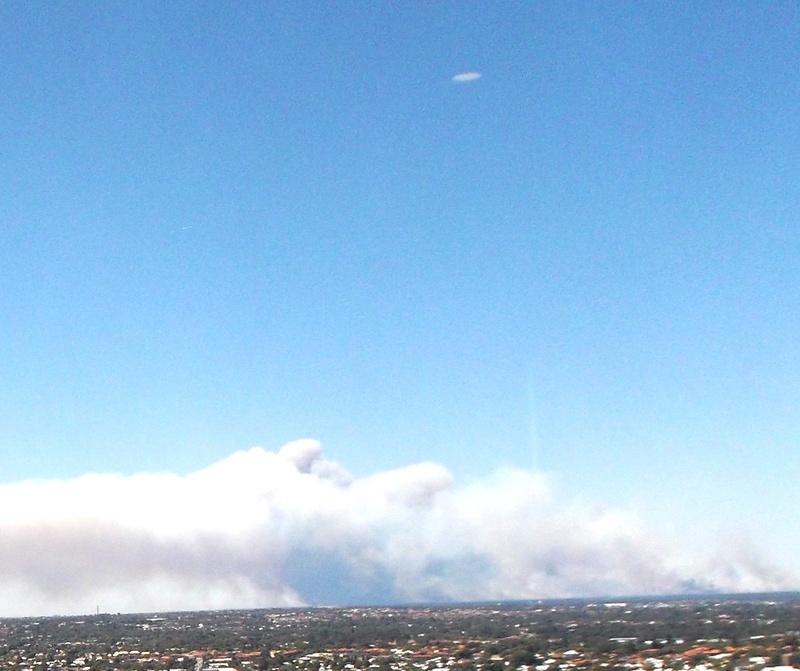 I asked Ashura/Arnap if they could help contain the fire, and took these photos of the Shem Arua uncloaked (I had sighted it in December, 2014, above Perth city while driving down from the hills, looking exactly like this, as a bright silvery-white disc-shaped ship). 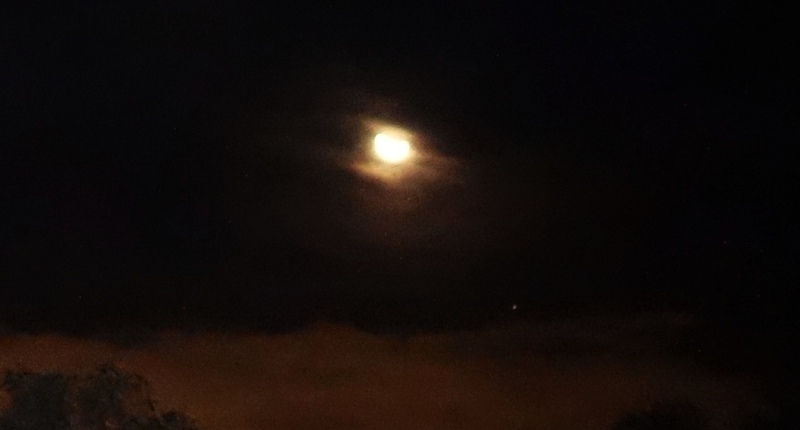 In the last close-up, you can see it half-cloaked again (which simply means, bending the light around it). 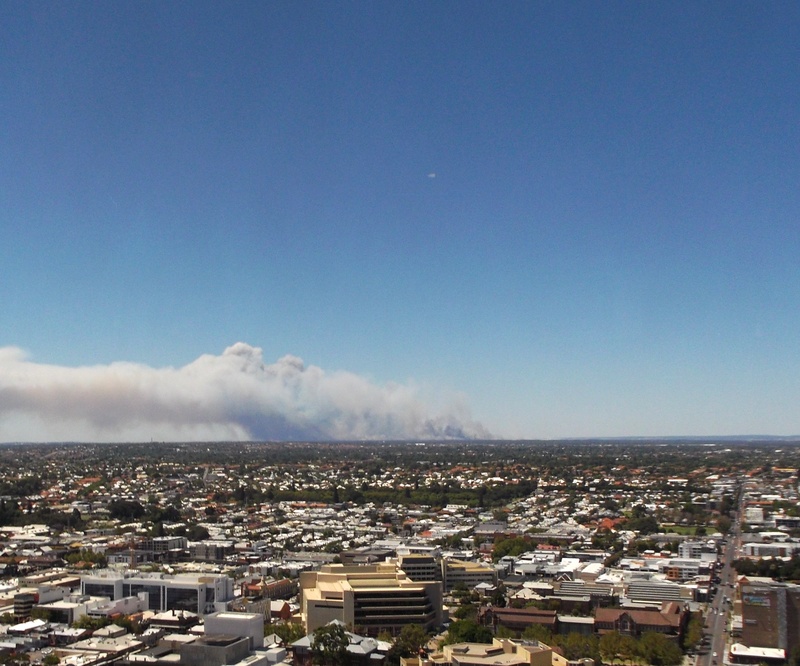 Bullsbrook is 42kms north of the city building I was in, to give you some idea of the scale of the ship. 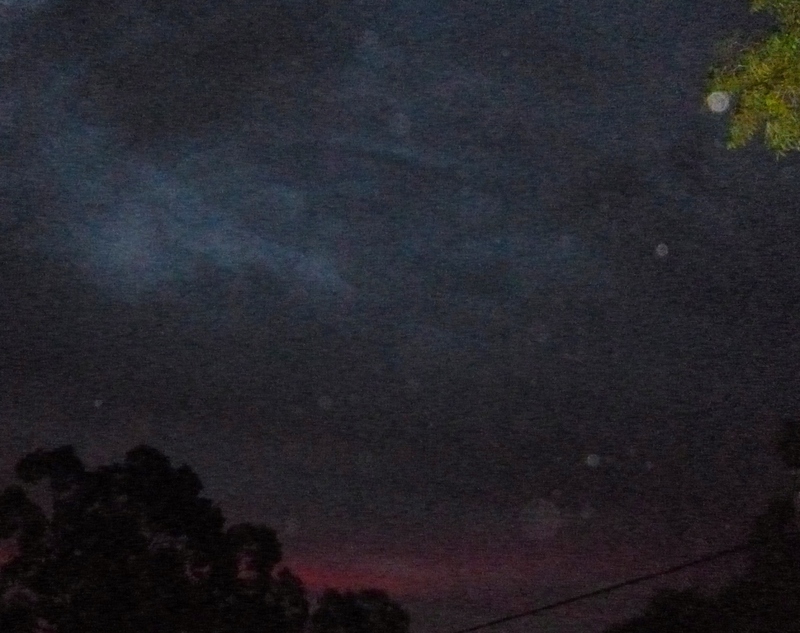 The next two photos were taken after sunset on January 12, 2015. 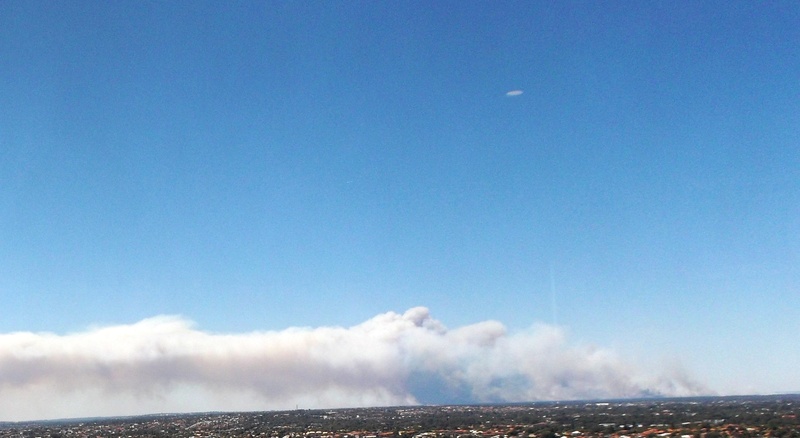 The images look grainy as the air was smoky from bushfires burning south of Perth. 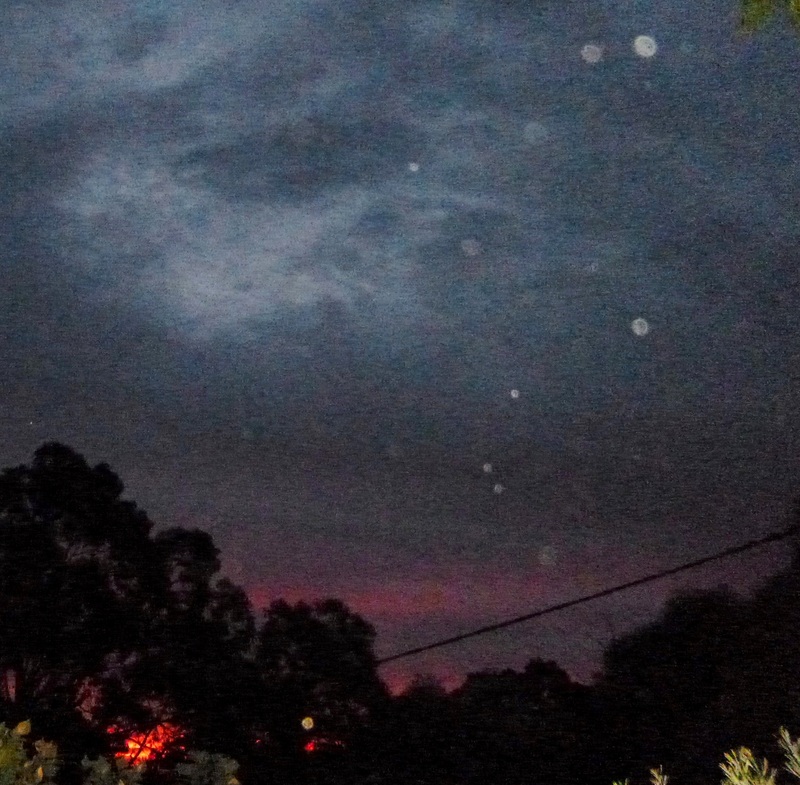 In the first photo, the Shem Arua was behind the dark, roughly disc-shaped cloud in the centre and you can see to its right and lower right, behind the foreground orbs, a number of smaller ‘walnut-shaped’ ships. 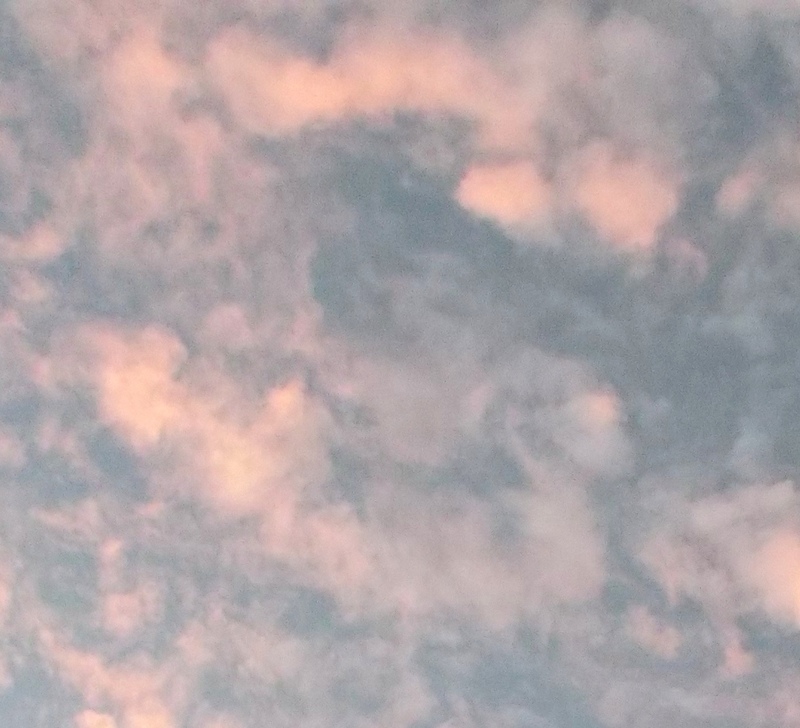 They look like small bits of cloud, but have a look at the regularity of the shapes, in the close-up. 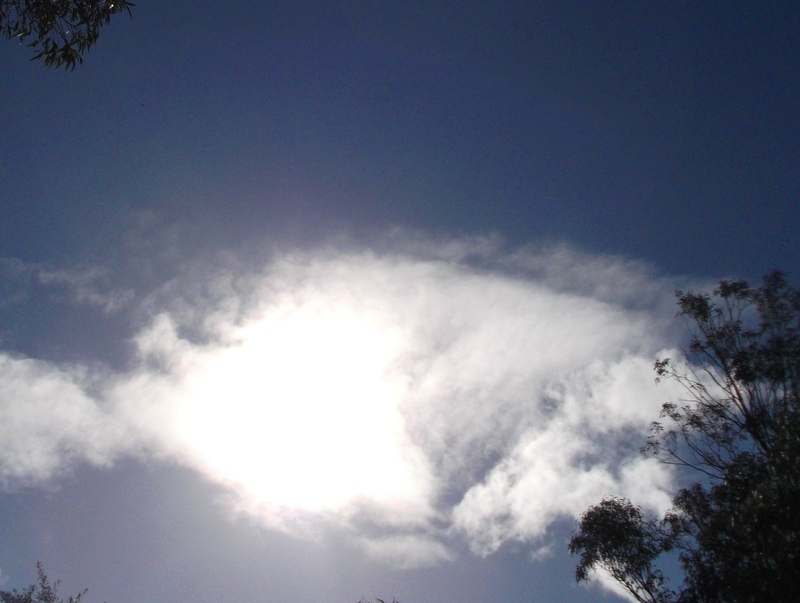 The next photo shows the cloud-cloaked Shem Arua with a more defined shape. 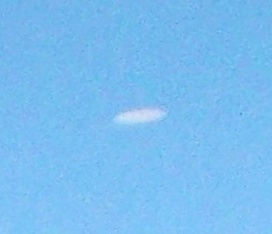 You can see the upper rim of the disc clearly, and also the ‘bowl-shaped’ underside of the ship. The following photos were taken in June 2014. 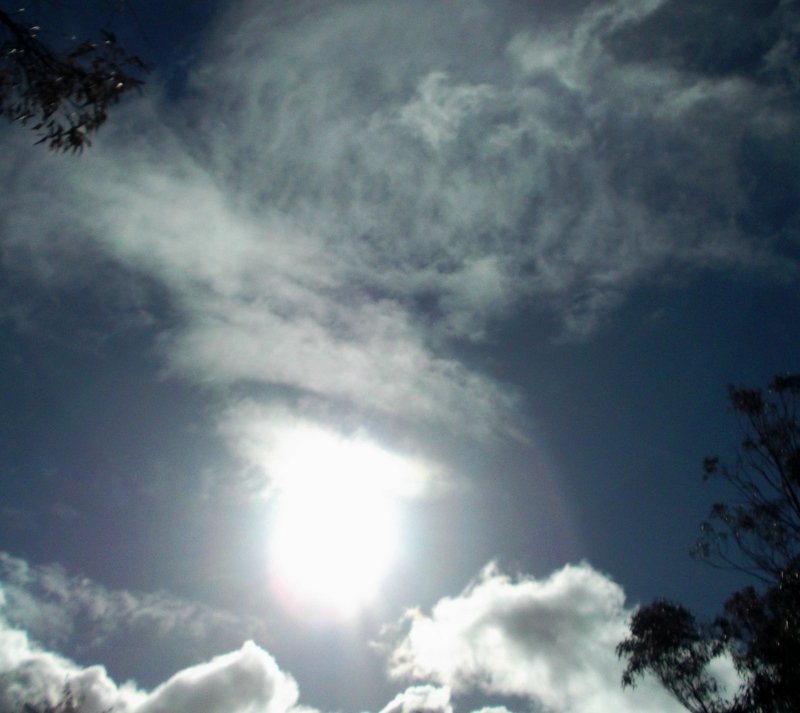 The Shem Arua was just above and in front of the Sun, its position marked by two slightly tilted bands under a swirling ‘cloud ball’ that formed above the Sun, which then funnelled down and wrapped around it (from my viewing perspective). 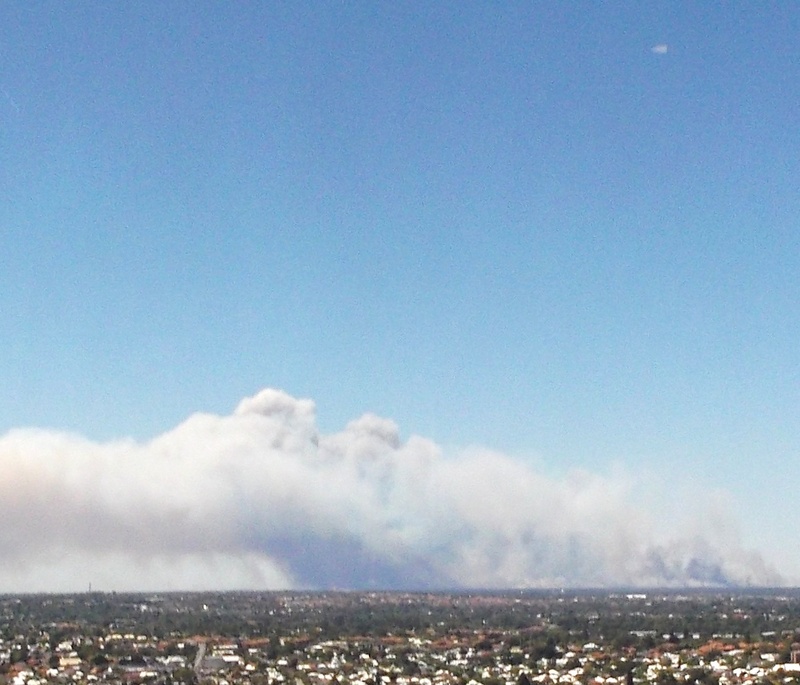 This happened fast, like watching a timelapse sequence. 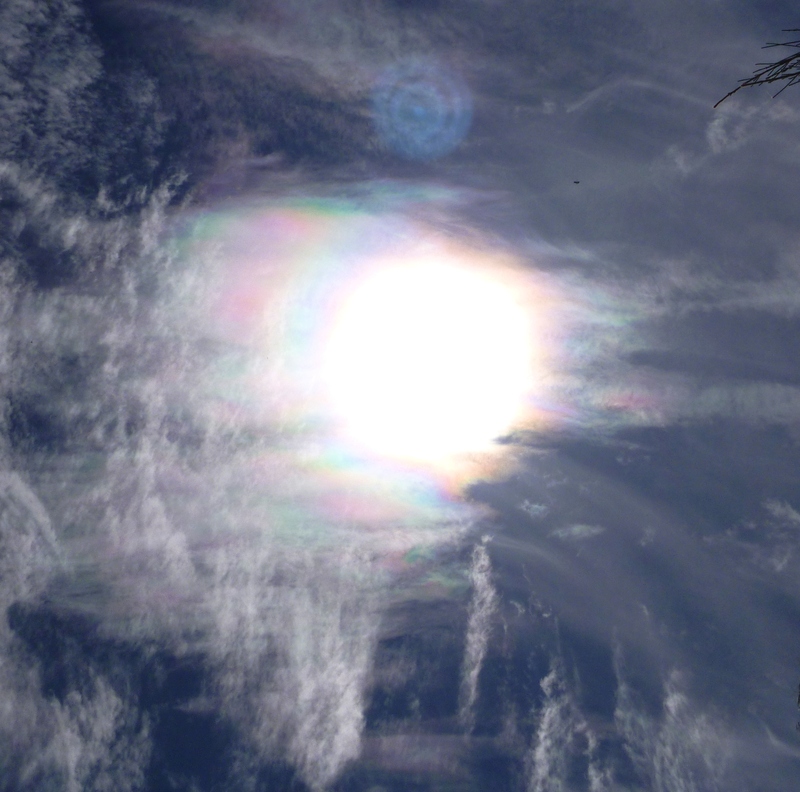 It will suffice here to say that a massive solar stabilization was needed, which was reflected in the 3-4D sky as the Sun being wrapped in a ‘blanket’, or ‘compression bandage’, energetically speaking. You can read more about what the ship (and fleet) was doing in this post. 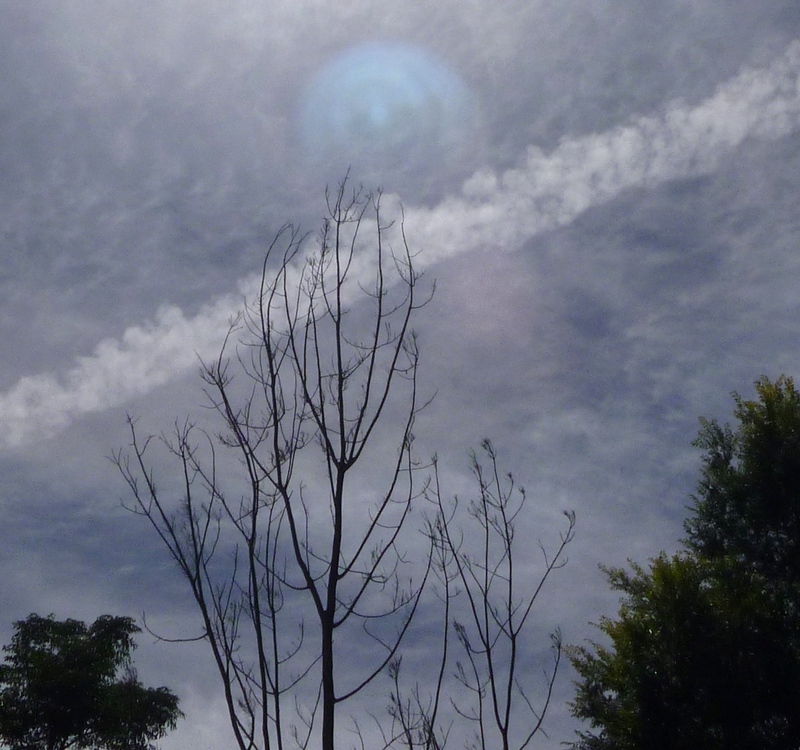 The next photos, from June 29, 2015, are of chemtrails rolling across the sky from the northwest, then the Shem Arua dispersing and detoxing them. 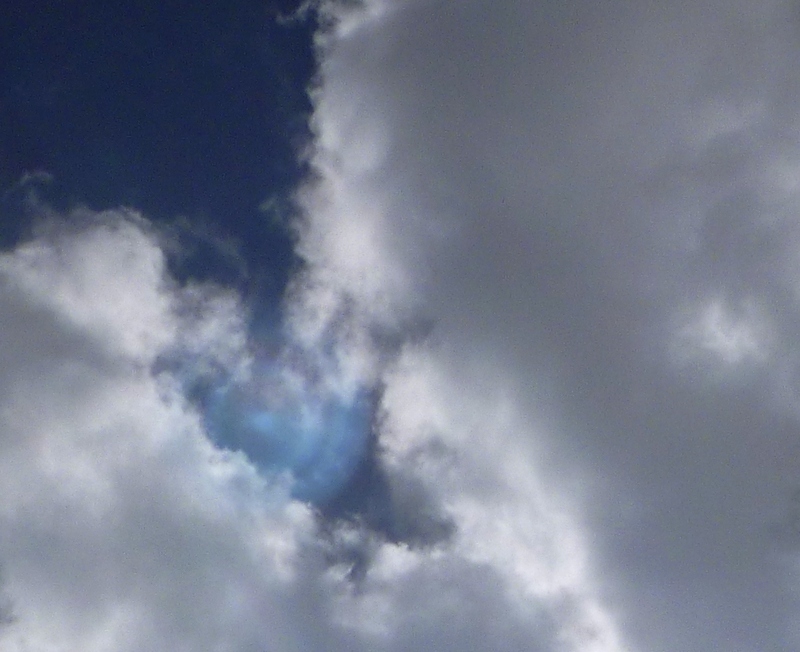 Disc-shaped cloud hole left by the ship June 29, 2015. I took the next photos while out walking on May 15th, 2016. 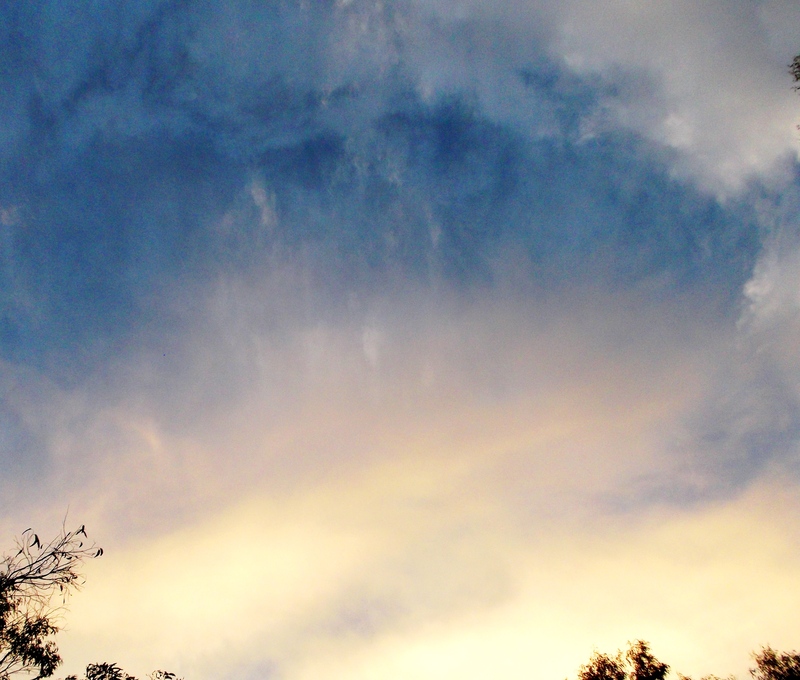 A ‘golden doorway’ appeared in the clouds overhead, and although they were moving fast, the doorway held firm – a very auspicious sign for this year. 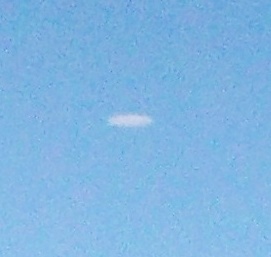 The Shem Arua was close by the doorway, and the shape of its upper rim can be seen in the clouds below. On June 9th, 2016, the Shem Arua appeared at a distance, flying low to the horizon under the Moon, and then veering upward the the north (indicating a particular ‘mission’ which will be possible to speak about at a later date). 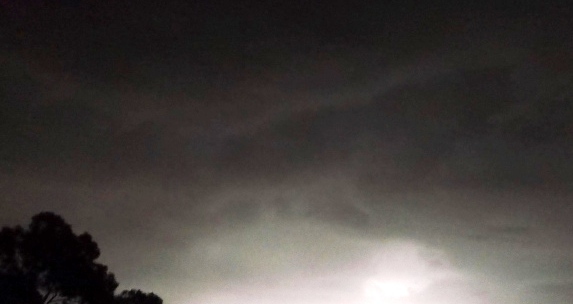 This next photo is of the Ahura’Tua, an Arcturian sister ship to the Shem Arua which was close by during a very intense summer storm. 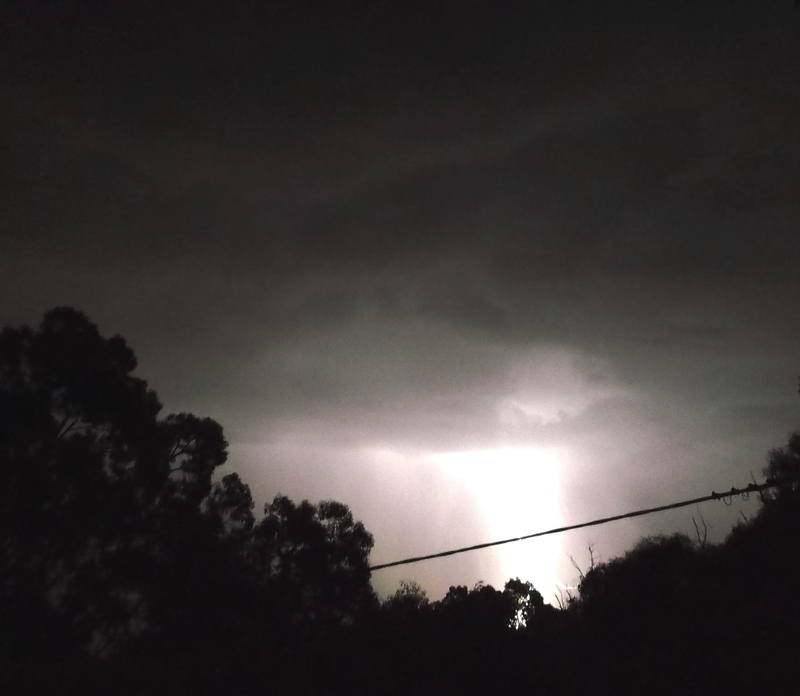 I was standing outside in front of the house, watching the weather, and felt this ship’s presence in the clouds directly in front of me, and sent them a thought, along the lines of ‘This doesn’t bother you at all, does it?’ The next second, the sky lit up with a huge pillar of lightning, and the ship became semi-visible for a moment just to the upper left of the lightning, as a shallow bow or crescent shape, like a winged disc, and above it a massive open V shape in the clouds. You can read about the Ahura’Tua here. 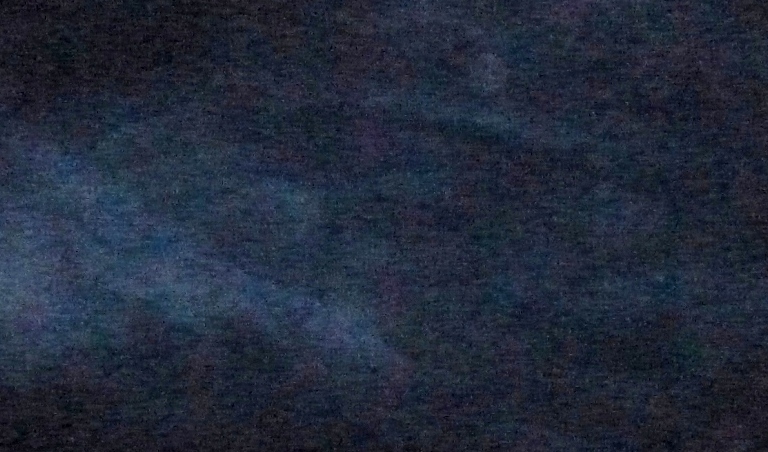 This photo is of another sister ship within the company of the Shem Arua, decloaked in daylight, which you can read about here. Though it looks cylindrical, this is actually a disc-shaped ship seen from side-on, with two small ‘pod ships’ on its roof. Silver disc-shaped ship (seen side-on, with two little ‘pod’ ships resting on its upper side) decloaks on October 21, 2015. From the second half of 2016, a beautiful Twin Flame pair of Sirian Lion Beings, Al’tara & Arudia, have been captaining the Shem Arua, and the oval silver-white pod-ship below flew down from the Shem, low over the house on April 16, 2018, with Al’tara and another lovely star sister Annahata on board. These photos are some of the ways Ashura has shown himself since 2013, beginning with his appearance as an ‘angel of white light’ dropping down beneath a cloaked ship. 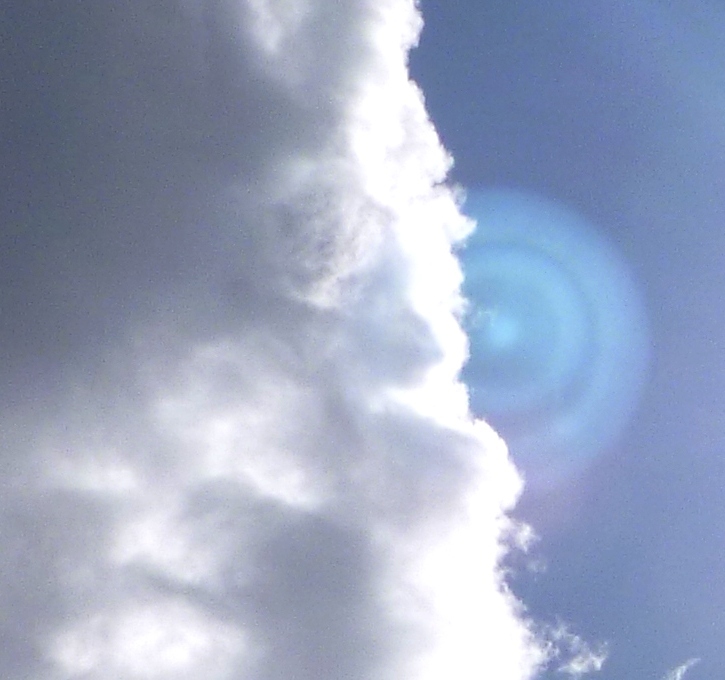 I didn’t have a deep enough connection then to know who he was, or hear his name, and felt him simply as an Arcturian Angel. 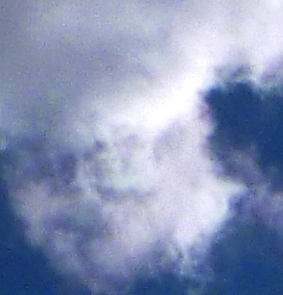 In early 2014, his face appeared under a ‘crescent’ or ‘bow’ of white light in the clouds, while we were connecting, and I understood his name/energy as Arnap…Bow-Steerer. 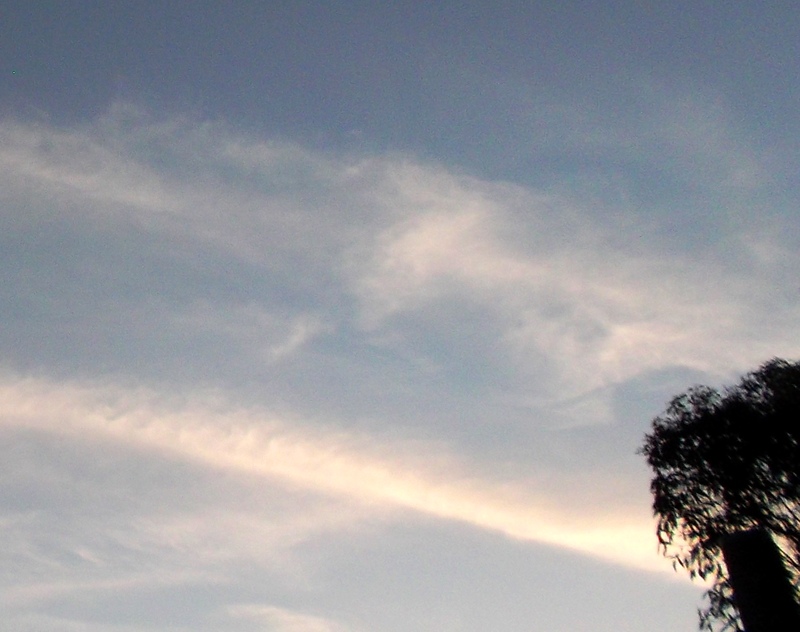 In late 2014, he appeared in his Angelic form, standing on top of a chemtrail (at a time when my house was being circled by planes and heavily chemtrailed), and neutralized the toxins. 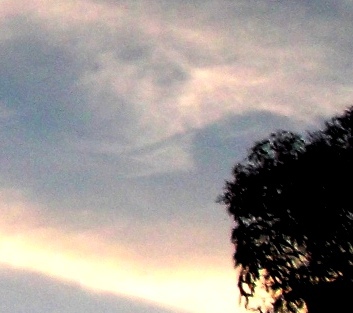 Again in the clouds, appearing here with a pink butterfly in front of his mouth (divine love, soul transformation) and horseshoe or rolled horn shapes on his head, which relates to both his form on Earth as Ashur in the ancient Middle East (depicted as a winged bull) and his connection with the Alpha Centaurians (Centaurus means ‘new bull’). The ‘horn/horseshoe’ shapes can also be read/felt as a number 3, energies of Trinity. Ashura and pink butterfly, Jan. 23, 2015. 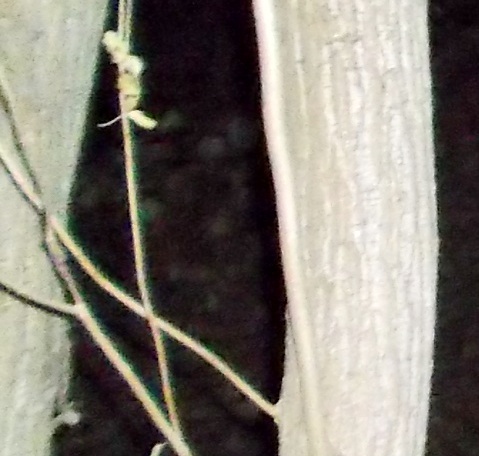 Ashura appeared in the beech grove in the garden here, at a moment when the Shem Arua‘s core was connected with a newly opened node on a ley line (life force path) of Gaia’s fifth dimensional light grid (see Lights in the Sky Part 2: Love on the Ground). 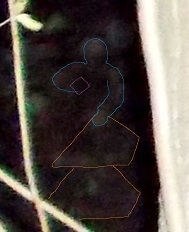 His outline/form is visible between the tree trunks below. He had one hand on a device in the ship consisting of two pyramids, one on top of the other, on the floor (if you can imagine the ship’s floor level with the ground, just in a higher dimension), and in his other hand a diamond-shaped crystal. He was stabilizing/protecting the frequency flow through the new channel in the grove (see this page). 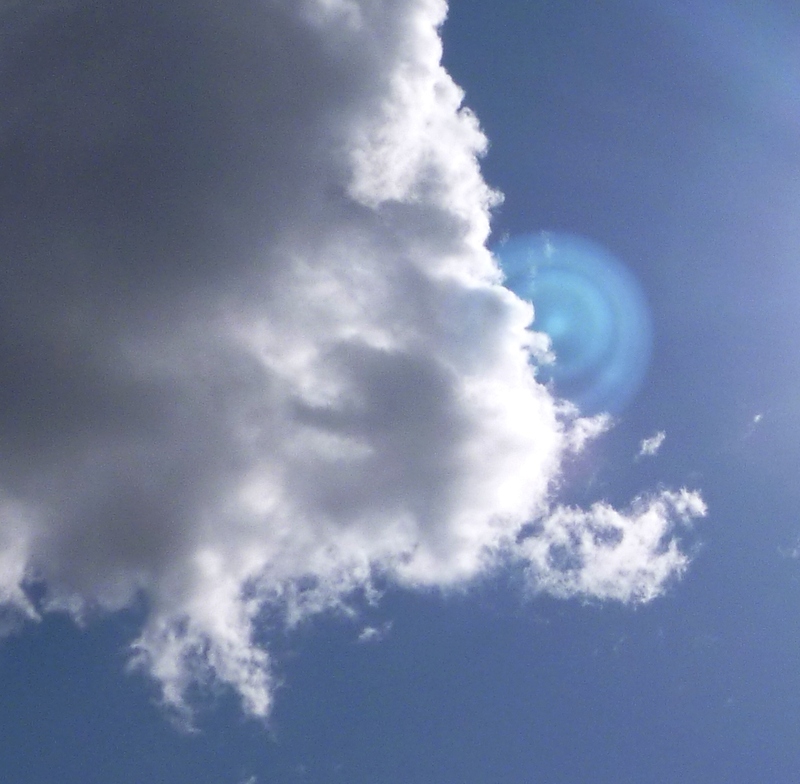 He often projects his energy to me as a large smiling green Orb, which I’ve photographed many times. These green orbs represent his soul energy aspect that was known to the Celts and Cernunnos, the Green Man. 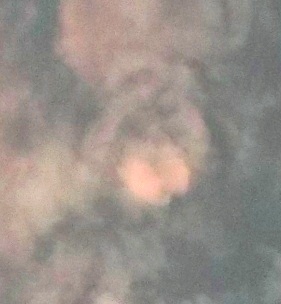 His face as it is in that soul expression appears clearly within the Orb below, with his face in the centre of the white ring, framed in dark hair. 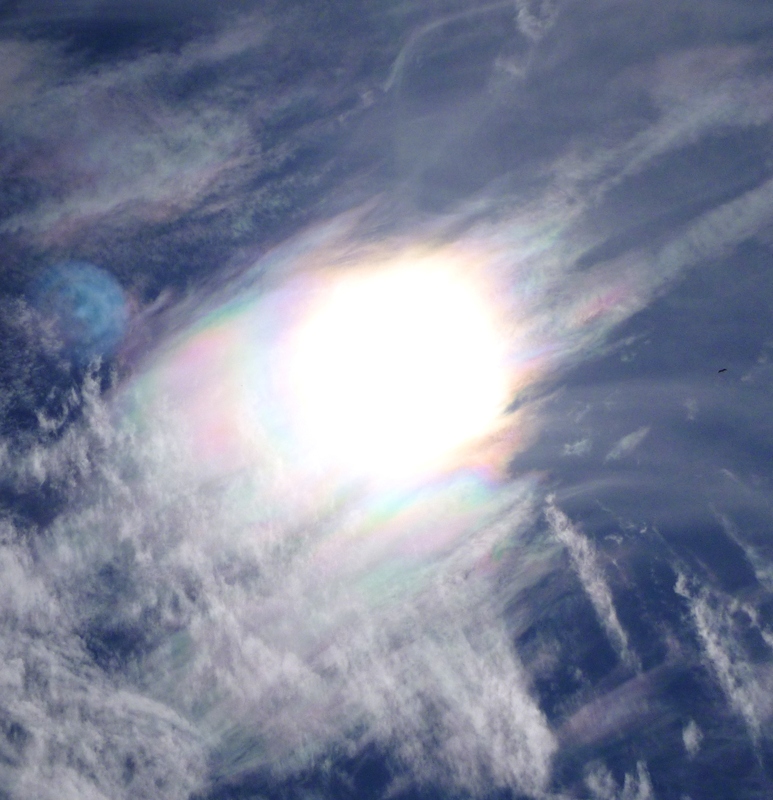 He also projects as a white orb, his/our White Rose energies, often with soft green or blue-green/teal blue blended in. Check the 2 year sky signs here..